I don’t know about you, but I have been waiting with baited breath for the introduction of the Cisco UCS M5 servers. Why? Simple. The Cisco UCS M4 servers are great, and I cannot wait to see what they have done to improve the Cisco UCS B-Series M5 servers. The Cisco UCS B200 M4 is my workhorse of a server. It is a great general purpose blade server from virtualization to databases to any application you can think of. I have very high hopes for the Cisco UCS B200 M5. The good news is, the wait is over! The Cisco UCS B-Series M5 servers are finally here! 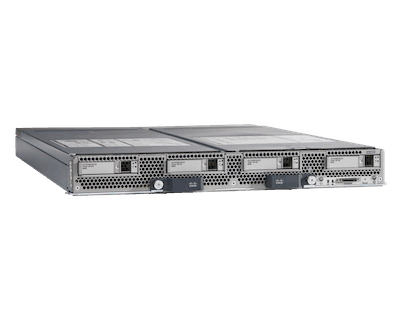 Let’s take a closer look at the brand new Cisco UCS M5 B-series blade servers. If you are interested in learning more about the Cisco UCS M5 C-Series rack servers, be sure to check out this link. There are two brand new Cisco UCS B-Series M5 blade servers. First,there is the Cisco UCS B200 M5, which takes up one of the eight blade chassis slots. Then, there is the Cisco UCS B480 M5, which is a wide blade that takes up to of the eight blade chassis slots. Now, let’s take a look at these new Cisco UCS B-Series M5 blade servers, and the features and functionality they bring to our Cisco UCS systems. Now, we will start by taking a closer look at the Cisco UCS B200 M5. Like its predecessor, the Cisco UCS B200 M5 can support two processors, and 24 DDR4 DIMMS for RAM. The Cisco UCS B200 M5 supports Intel Xeon Scalable Processors (which we’ll talk more about in a bit) and DIMMs up to a speed of 2666 MHz, and 128 GB in capacity. What’s really, really exciting about the Cisco UCS B200 M5 is that it can support up to two GPUs. Yes, you read that right. This means in the 6 RU form factor of the UCS 5108 Blade Chassis you can have 16 blade GPUs. If you choose to place two GPUs in the B200 M5, one will be placed in the front mezzanine slot. It is important to note that this is where the drive cage and raid controller are placed, so if you’re using two GPUs, you lose the ability to place drives. Speaking of drives, if you need onboard storage on your Cisco UCS B200 M5 blade, the possibilities are endless. It supposed HDD, SSD, and now NVMe. It can also support PCIe Flash and SD or M.2 (aka “gum stick”) memory as well, which is not impacted by placing a second GPU in the blade. You an use this as your boot media. Now, let’s take a look at the Cisco UCS B480 M5. Think about doubling the capacity of a Cisco UCS B200 M5 in CPU, Memory, and IO ability. This allows for 4 CPUs, 48 DIMMS, and up to 4 GPUs. This is ideal for intense workloads that can take advantage of all this power, and once again, is very dense. That’s 16 CPUs and GPUs in 6RU of space. 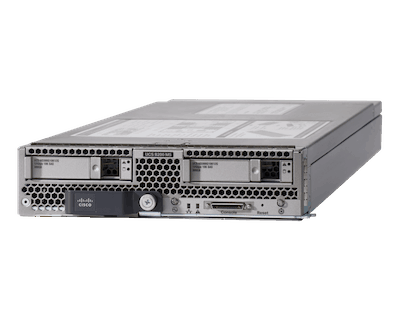 Like its smaller sibling, the Cisco UCS B480 M5 supports HDD, SSD, NVMe, PCIe Flash, SD, and M.2. It will be available in August 2017. The Cisco UCS B-Series M5 launch also aligns with a major launch of Intel’s. The Cisco UCS B-Series M5 platform will be using processors from the Intel Xeon Processor Scalable family. These processors are also know as the “Skylake” family of processors. The “Skylake” family can feature up to 28 cores. In 2019, the Cisco UCS M5 B-Series will introduce the “Cascadelake” CPU family. For more on the Intel Xeon Processor Scalable family, be sure to check out this blog from Intel. What’s Missing In the Cisco UCS B-Series M5 Family? If you’re familiar with the UCS UCS B-Series M4 blades, you may notice something I missing. It is time to say goodbye to the B460, B260, and B420 blade servers. These larger form factor blades are replaced by the Cisco UCS B480 M5. The good news is the Cisco UCS B200 M5 and the B480 M5 can easily handle a number of workloads – I do not think their M4 counterparts will be missed. The B200 M5 will require UCS Manager (also known as UCSM) version 3.2(1), and the B480 M5 will require UCSM 3.2(2). As usual, UCS Manager updates are non disruptive to your environment, so it will be easy to accommodate the Cisco UCS M5 B-Series hardware. If you are looking to get some hands on experience with new versions of Cisco UCS Manager before you upgrade, the Cisco UCS Platform Emulator or UCSPE is a great way to do this. You can read all about the Cisco UCS Platform Emulator here. I have every blog you would ever need to read on getting started with, configuring, and using your UCS Platform Emulator on that section of my website. If you are interested in resources to dive further into the technical details behind the Cisco UCS M5 B-Series blade servers, be sure to read about Navigating Cisco UCS Documentation: Data Sheets and Spec Sheets here. If you have never looked at the B200 M5 Spec Sheet, is is your one stop document for truly understanding how the Cisco UCS B200 M5 works. Cisco Spec Sheets have more useful information than you ever thought you needed, such as memory options and configuration, connectivity options, and a detailed list of all part numbers you will need to customize your Cisco UCS B200 M5. The best part about Cisco UCS spec sheets is they are all organized the same way, so they are very easy to compare. You can find the Cisco UCS B200 M5 spec sheet here. If you really want to get a good picture of how Cisco UCS B-Series blade servers have evolved, make sure you also take a look at the Cisco UCS B200 M4 spec sheet here. The requirements for the Cisco UCS M5 C-Series rack servers are similar, be sure to check out this link to learn more about the Cisco UCS C-Series rack servers.